Classic Down East Labor Day cookout with all the fixin's at Goomp's Camelot-by-the-Sea yesterday. Rib eyes, brats, dogs, potato salad, corn on the cob, Eddie's beans, mighty Caesar. Susie's blueberry pie with pluperfect crust, Ellen's brownies with ice cream for dessert. An after-lunch walk down to Pebble Beach. Lots of forestrial devastation from the wrath of Earl just last week and a nor'easter that had taken out Goomp's power for days a couple of months before. Matthew back east from Iowa on Sabbatical with the Divine Miss Penny (above) in tow. The sweet little pup broke loose from her tether and unwittingly terrorized/fascinated the feline community in residence. Tiny was not amused. A revelation: There is life outside of social networking. Renewing old bonds, reminiscing about the good times of our shared salad days and sharing dreams of adventures to come. 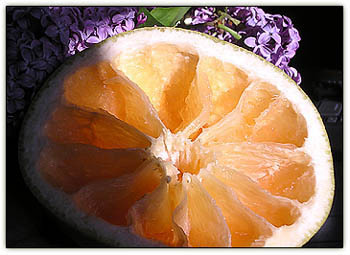 "For the beauty of the earth, For the Glory of the skies…" Grapefruit and lilacs for breakfast Down East early morning. "I'm savoring the revealing contrast between Drake's seafaring 'reach for the stars' vision and Michelle Obama's landlocked 'audacity of whining' (Powerline's expression)," we wrote in the comments of Bird Dog's totally awesome "Annual re-post: Sir Francis Drake's Prayer (1577) at Maggie's Farm. What we said two Mem Days back still applies, big time: "Sunrise this morning over Eastern Point across the river from Goomp's, headquarters for the family's Memorial Day salute to the awesomely brave and good and true fellow Americans who give their all so we might enjoy such natural wonders. We think you know who you are, our beloved fellow bloggers and readers who serve and love those who serve. We cannot thank you enough. God bless." You start working hard and sacrificing, and you think you’re getting closer to the bar, you’re working and you’re struggling, you get right to that bar, you’re reaching out for the bar, and then what happens? They raise the bar. Raise the bar. Shift it to the side. Keep it just out of reach. Is Michelle Obama "too pleased with herself," venturing on Francis Drake's "wilder seas" even as she urges her listeners to instead "dream too little" and sail "too close to the shore"? The soft bigotry of low expectations? While England and the Free World shlepped, we've been cooking up a storm for Sunday's Easter Dinner Extravaganza Down East at Goomp's, even as Tiny keeps her end up washing her face atop the dining room table. Second Easter without our precious Babe. Here's essentially the menu, from Easters past. Handy to have it all here on the blog for quick reference when the holiday rolls around. Across the room from us here at the computer our Scott Brown lawn sign and a selection of recent and not-so-recent reads caught the early-morning light fantastic. The pepper mill is on its last legs, confined to a plastic bag to contain its innards, Snowden's-Secret like, till Tuck can feel its pulse and let us know if there is any hope. But oh, what the late afternoon sun can do to transform the cards and bowls and random objets of the kitchen counter into a lyrical play of light and shadow. We put the Sausage and Apple Stuffing into containers and then into the freezer, out of harm's way. We've been known to raid the fridge in earlier days, leaving barely enough to stuff the center of the Crown Roast on Easter morn. Also on ice, a fresh batch of Sweet Potatoes Puree, ready to receive the purple peeps (they don't appear to have the white ones any more) for five minutes of reheating before serving. And for this evening, Friday Night WSJ Crossword Puzzle Date Night in Chelsea-by-the-Sea, our totally awesome Fanny Farmer's Beef Stew. No wonder we have barely had any time for blogging or tweeting of late. *Blog title is from Matthew 28:6 (King James Version). Over seven hours without electric power starting around 3 in the wee hours this morning. First the good news: We'd planned to catch reruns of what Thad McCotter called Obama's "ShamWow Summit," but no electricity, no C-SPAN. We hear tell the much ballyhooed proceedings ended Republicans=1, Obama=0. Even CNN's David Gergen and Gloria Borger had to admit it. Thank you all who watched so we didn't have to. And now the bad news. Restively wakeful in the hour of the wolf before dawn, "when the sleepless are haunted by their deepest fear, when ghosts and demons are most powerful" and "all you can see is the troubles and the problems and the ways that your life should've gone but didn't," we were deprived of our usual 24/7 opiate, the ironically soothing background noise that television with remote provides. Added to that, when Tiny came to bite our nose and claw our face at her usual breakfast time, it was still too dark for us to see well enough to administer her insulin shot on schedule. Finally, and perhaps most devastating, with no access to the internet, our endorphin levels dipped dangerously low. On the cell phone once it was light, we suffered through the tinny Musak and automated messages from NStar assuring us how much they cared about us and were finally informed that yes, much of Chelsea was without electric power — a casualty of high winds after midnight — and no, they couldn't say when the power would be restored. When the affable, professional NStar team finally arrived a couple of hours later in a caravan of three spiffy white vehicles, they stopped just a few yards from our house and set up their orange cones to warn oncoming traffic to proceed with caution. We strolled over to see what was what. Pointing upwards, their diagnostics man showed us the source of the outage, a disconnected transformer atop the telephone pole in front of our next-door neighbor's house. They went right to work, stabilizing the truck with jacks and lifting our hero in the cherry picker high amongst the tortured branches of a venerable Silver Maple. We went back inside for a moment to see if power had been restored, but not yet. Then back outside, where one of the team was walking towards us, gesturing thumbs up. We shouted "My hero," but he said no, the guy in the cherry picker is the hero. We returned thumbs up and hurried back inside, where the computer studio and kitchen were alive with the music of our social-networking sphere. Homeland security scenes from the Christmas season down Chelsea and Down East last week. For her fans, a lion shot of Tiny, above, keeping watch out the kitchen window for any signs of the intruder. With twice-daily doses of insulin, weekly glucose and weight checks are showing steady improvement. Earl Grey stopped by for a nip, and Tiny wore her heart on her sleeve, not running him off the land as she does every other cat that dares set paw in her territory. A beautiful necklace — girls just wanna have jewelry, according to our sis — lovingly clasped to her neck by Barney I. Elder niece — the one they say is the spit and image of Miss Sissy in our salad days — as sultry odalisque on Goomp's keeping-room couch Christmas Eve. Beef Tenderloin with Roasted Shallots, Bacon and Port, orange slices and sprigs of rosemary surround a bed of Carrots and Brussels Sprouts, centerpiece of the Christmas groaning board. Great sandwiches next day. We're the sister and aunt of these beautiful people. Happy New Year to all our wonderful readers and commenters! We gathered together to ask the Lord's blessing Down East yesterday, and love was in the air. Our sis and her Barney II paused oven-side for a Pieta Moment with a twist, the son holding the mother up. We hadn't meant to brine the turkey, but since the bird required soaking in a sinkful of water for an hour before cooking to get out the final chill, we poured on the salt. According to Goomp it was the bestest, moistest turkey he'd ever had in all his ninety years. Sweet and savory, light and dark, smooth and crunchy, the foodstuffs conspired to tempt and satisfy the discriminating eye and palate. We'd been a little concerned when the homemade cranberry sauce didn't seem to thicken as much as expected. Following the recipe on the Ocean Spray package, you bring 1 cup each of water and sugar to a boil, add the cranberries and cook ten minutes, then strain to remove solids. As with everything else, the result though not as thick as your typical canned, was the best ever, a luminescent jewel. I never QUITE understood the premise, since each of the three would be playing to different audiences, but it was supposed to be based on preparation technique and audience response. Christian and I agreed that if Goomp asked for seconds, Christian's was CLEARLY the hands-down winner. I don't know, re: official name. I'll admit that "Carrots and Parsnips" doesn't sound too glamorous, but it is what it is. ): If you were the Food Channel, you would probably call it "Roasted Root Vegetables with Herbed Butter sauce." Not having a mandoline in the home kitchen, Christian had julienned by hand, and consulting with a friend who happens to be a professional cook, he topped off the dish with a secret ingredient, Panko (Japanese bread crumbs). The proof is in the pudding. We ate it all up, and Goomp did indeed ask for seconds. He'd apparently had a bad experience with parsnips in his childhood and had never tried them since. Just another day on the couch for Goompa's Purrky yesterday, but we had our eye on a bigger prize, our pater familias's 90th birthday. We three children, two spouses and four grandchildren drove and flew in from points south and west to toast the Energizer Bunny at his Down East homestead, Camelot-by-the-Sea. Formal posing for pictures? Never our thing, as we're totally into beauty in unexpected places, snapping the shutter early and often before and after formal "say cheese" set-ups to capture Cartier-Bresson's "decisive moment." Ellen's Beef Strogie was to die for, a transcendent reincarnation of our mother's signature dish with salted butter and bouillon cubes front and center. VERY politically incorrect. She's promised to write it all down so we can publish here in our Cold Turkey Cookbook in the "Full of Calories and Loving It" section. She: He did, indeed, enjoy his birthday celebration and was totally delighted that all four grandchildren were able to attend. He reports that the pumpkin muffins were so good that you had TWO! We: Yes. Plus I took some home. Delicious! She: I know that I took a Toll House Cookie, just to be polite, and THEN … I wanted to scarf down the whole container, but retrained myself. We: Retrained yourself? Love it. You'd have to. She: I love how all four grandchildren are great cooks. Whatever it took, and I'm sure that Mummy had a lot to do with it … my boys LOVE to cook. They are not slugs on the couch, watching football. They watch some football, then go whip up a meal. AND they do laundry and know how to iron. I think being a sluggard has helped me to raise capable children. Update: Modulator's Friday Ark #270 now boarding. He loves, and she loves … Tiny and Earl clowder the light fantastic this afternoon as foggy overcast gives way to "blue skies smiling at me." Even as Tuck sands and paints and climbs ladders to the sky to spit and polish our humble home by the sea. "It compresses, enervates, extinguishes, and stupefies"
Sunrise at Camelot-by-the-Sea from Goomp's terrace this morning. We remember the first inklings of the emasculating Marx-lite mindset beginning to infiltrate our elementary and high school classrooms in the fifties and sixties, when reflexively p.c. teachers -- before anyone really knew what p.c. was -- told us there was no such thing as human nature and keened that we shouldn't have a battle hymn for a national anthem. We should change it to "America the Beautiful," they told us. While we love the poetry and religious fervor of "Oh, beautiful for spacious skies," with its unspoken recognition of what used to be called "Manifest Destiny," as a national anthem it falls short, missing the point that came crashing into our consciousness on that awful 9/11: Freedom isn't free. Last gasps of summer. Tiny attends Ellen's plate for a Sunday bookend to our season-opening lobster bake with all the fixin's last May. The light fantastic caught in the folds of a little linen shirt hung out to dry. BROKAW: "What's been interesting to me is that the Republicans have raised the public option as some kind of Orwellian monster. Half the health care in America is already delivered by the government ... Medicare, Medicaid, the Veterans Administration, Federal Employees insurance ..."
GIULIANI: "That's part of the problem. Part of the problem is that half of it is already in the hands of one massive monopoly. You make that monopoly greater and you destroy private insurance." Update: "The most alive is the wildest. Not yet subued to man, its presence refreshes him," wrote Thoreau. Head on over to Modulator's Friday Ark #260 and be refreshed. Update II: The News Junkie at Maggie's links. Blue skies and gentle west winds with occasional gusts graced our Sunday Family Fourth Festivities at Goomp's Camelot-by-the-Sea down east. Old Glory, above, was in her glory. Matthew and Susan pose in a proud and loving mother-and-son embrace with the Brahmanesque York Reading Room and Atlantic Ocean falling away behind. Click here for higher-resolution image. Suzi's Red, White and Blue Strawberry/Blueberry Shortcake hit our sweet spot. All agreed Pillsbury's Shortcake beats those dry, tasteless homemade ones of our new-bride days when you had to prove your culinary worth by making everything from scratch. Working off our just desserts, Sue, Ellen, Matt, Tuck, Ben and ourselves tripped the light fantastic in a rousing rendition of the Cliff-Walk Two-Step across the York River down by York Harbor Beach, with the Hahbah in the background. Mother ponders what to do next as son checks camera settings. Earlier on the opposite side of the river at Goomp's, a groaning board of Fourth-of-July faves was downed with relish: Grilled Chicken Sate with Peanut Sauce, rib eyes, Kayem [Chelsea's own!] dogs — both pork and beef — on grilled buns, corn on the cob, Eddie's Beans [Thanks, Ellen! ], Sissy's Superb Potato Salad and Corny Cornbread Mini Muffins. Did we forget anything? Oh, yes: The champagne flowed! Note gray roof of Goomp's house in background across the river, upper right amidst native forest greenery. 'Wish the day would linger longer … They left us laughing and begging for more. A wonderful time was had by all. Click here for higher-resolution image. A sport is a part of a plant … that shows morphological differences from the rest of the plant. 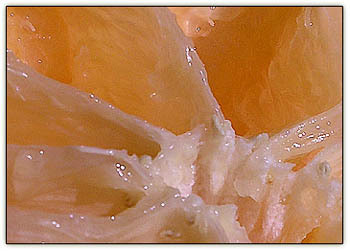 Sports with desirable characteristics are often propagated vegetatively to form new cultivars. Such selections are often prone to "reversion," meaning that part or all of the plant reverts to its original form. Dwarf Alberta Spruce was discovered in 1904 in the Northern Rockies near Lake Laggan, Alberta as two Arnold Arboretum botanists awaited the arrival of their train to take them back to Boston. Today, they would meet with serious government red tape and social castigation, but at the time they spotted the stunted seedling and recognized it as something new and different. Without a second thought, they dug it up and took it home with them. The most famous of the pair was Alfred Rehder, who became known to thousands of students for his Manual of Cultivated Trees and Shrubs. In the1940 edition, Rehder was the first to use a plant hardiness zone map based on minimum winter temperatures. His first hardiness map had only seven zones but served as the precursor to the 12-zone USDA map we use today. Heading south back to Chelsea on I-95 Monday morning, we found ourselves playing a bit part in the big traffic story of the day, a smash-up involving three cars and a tanker truck in the northbound lane. Police cars, ambulances, fire engines, a dump truck full of sand and a hazmat vehicle rushed to the scene, and a helicopter hovered overhead. The highway was closed for hours as emergency workers tried to stem the flow of oil into the nearby Merrimack River. We escaped with a relatively modest 45-minute delay and a creepy feeling at the horror of it all, compounded by the fact that just as the traffic was starting to slow down, we had been reading the chapter in Jonah Goldberg's Liberal Fascism where Lucianne's elder son makes the argument that Woodrow Wilson was "the twentieth century's first fascist dictator." Update: More pics and info re crash and clean-up from local Daily News. Other than that, a perfect weekend.